I couldn’t sell it to My Kevin. He gave it half an episode and said I should talk about “The Crown”. I couldn’t sell it to Drew. Drew: Didn’t like it. Told her to listen to Kevin. It’s all the things you love about Letterkenny, and the friendships slash mockumentary style slash awesome live ad-libbing and story telling of Trailer Park Boys, set in a fictional town in Ireland. First you have to know what that word means. It’s like when we say “cool” or “nice”, could mean any number of things like entertainment, gossip, fun times…and so on….and they say it a lot. This is the first YouTube series to ever be made into a film! 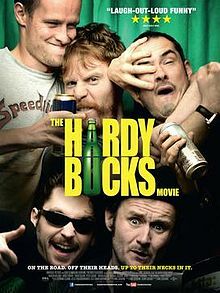 The Hardy Bucks live in a small Irish town where the best thing about it is the road out of it. Eddie, Buzz, Boo, Frenchtoast and Viper are a nice bunch of lads who partake in the kind of antics nice bunches of lads would partake in…drinking, riding, and gossiping. Seems like the boys are plagued with terminal bad luck, in a good way. Just about everyone is related. And as my daughter said while trying to breathe and laugh at the same time, I love watching dumb people. So, for real, here’s the craic. Start at season 4, available on Netflix, or watch Hardy Bucks the Movie, then work your way back to season 1. They work out the kinks and really develop a funny, and dark, look at small town life. The 5 choices I gave my test crew? The Crown, with 2 seasons under its’ belt, and 2 more ordered from Netflix, this show was the first time I ever cared about England’s royal family, and Prince Phillip is a dirty, dirty dog. Versailles, also a romantic docudrama series about King Louis the Fourteenth. Two seasons on Netflix, with another promised, and it’s done. Love this show, it sends me down the ancient history of Spain Google rabbit hole. Several seasons with long episodes. Still Game, a show about pensioners in Scotland. Think modern male Golden Girls. FOX is killing the game here with a pre-pre-pre Batman Bruce Wayne, new characters, a little like CSI meets Law and Order feel. If you love Batman, you’ll hate it. If you love Batman, you’ll love it. Let me know which one you’d like to hear about, or send me what you’re watching!